"When you've never driven an F1 car before and after two laps you're taking Eau Rouge flat, well… I couldn't believe it." Andrea de Cesaris trails off. And it's not from embarrassment, because while some might find it hard to take - you've competed in 160 grands prix and suddenly there's this kid who you've never heard of and the only experience he has to his name is 20 laps of Silverstone three days ago, and now your race engineer is showing you telemetry which confirms the new boy is quicker than you, and it's Friday and not even lunchtime yet - Andrea feels no bitterness. Just sheer admiration and a sense of pride that he was there. Andrea was Michael Schumacher's first Formula One team-mate and he knew he would be dining out on that story for the rest of his life. "I said to my engineer: 'This guy's got guts'. I realised straight away that he wasn't just some newcomer - this guy could really drive. Now it's easy to say that he was really bloody quick, but Spa is no picnic. It's one of the toughest tracks, very quick, long and extremely challenging. In short, it's unforgiving and I expected the rookie to struggle there. I'd never met him before we arrived at the circuit. Straight away he was as quick as me. My engineer, Gary Anderson, came to me and said: 'Look, Michael is taking Blanchimont flat and you're not. You have to take this corner flat'. For me it was a very demanding weekend!" Legendary British journalist Denis Jenkinson was standing at the crest of Eau Rouge and took note. 'Jenks' was a man who had spent the previous half-century watching the best in the business at close quarters. He timed each driver with a stopwatch from the La Source hairpin through to when they passed him, and announced the 22-year-old fifth fastest behind Senna, Mansell, Patrese and Berger. "He was right of course," says Financial Times writer James Allen, who was next to Jenks during Friday qualifying. "The Jordan looked amazing. Jenks said that we should keep an eye on this boy. He looked like the real thing." Michael Schumacher was an underground talent who had gone largely unnoticed by all but F1's sharpest spotters. After winning the German F3 title in 1990 he had been signed to Mercedes-Benz, who ran him in their Group C Sportscar team alongside countrymen Karl Wendlinger and Heinz-Harald Frentzen. "Many stories have been told about who really was the quickest of us three," recalls Frentzen. "Let's put it this way, we were pretty much on the same level in those 800bhp silver arrows, and it was not always Michael who was quickest." "I met Michael once when he was in Group C," says Gerhard Berger. "I wouldn't say that I made a note of him having the potential that he would go on to prove, because once you're in Formula One you don't pay much attention to Group C and places like this. We were all a bit surprised when he turned up at Spa and was really strong. He came out of nowhere really." The Jordan seat had come on the market following an incident which occurred at London's Hyde Park Corner some eight months previously. 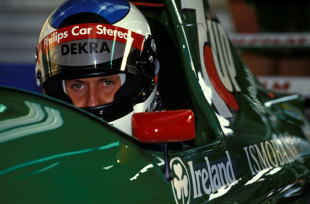 Bertrand Gachot was driving his girlfriend's Alfa Romeo when he collided with a taxi. An altercation between Gachot and the cabbie ensued, which resulted in the taxi driver being sprayed in the face with CS gas and Gachot appearing in court. Illegal in the UK, possession of the CS gas canister earned Gachot a six-month prison sentence which ran concurrently with the 18-months he received for assault. The F1 driver was led away in handcuffs. It was just a week before the Jordan boys would be heading out to Belgium and the team was short of a driver. Eddie Jordan considered several experienced pilots before he agreed to take Michael Schumacher, along with £150,000 of Mercedes money. "I think Eddie must have seen him winning F3 in Macau," says former Jordan commercial director Ian Phillips. "There were various people representing Michael coming to GPs and looking around. When Gachot got thrown in jail, Eddie sent me down the traditional route, which was: Derek Warwick, Keke Rosberg or Stefan Johannson. The Sunday before the race Eddie called me at 6pm to say 'I've done a deal with Michael Schumacher'. Eddie had been on holiday in Spain and had agreed the deal over the phone with, principally, Jochen Neerpasch, who was the competitions chief for Mercedes-Benz as well as an agent for IMG (Mark McCormack's sports management company). Michael was at the Nurburgring that weekend with the Sauber-Mercedes team. "Twenty-four hours later we were all at Silverstone," says Phillips. "Willi [Weber - Michael's manager] and Michael turned up. He was as good as gold. We did a seat fitting for him, and the next day we went testing. After four laps Trevor Foster came on the radio and said 'I've got to call him in and tell him to slow down. Phone Eddie and tell him we've got a star'. I rang Eddie, and Eddie said 'Tell him he's in'." "That's absolutely correct," confirms Foster, who was Schumacher's race engineer in Belgium. "We did a very small shakedown after the trucks had already left for Spa, just to let Michael familiarize himself with the controls. Instantly, within three laps, he looked like he'd been in the car all season. He looked totally at home." Schumacher's first taste of F1 came on the 1.969 mile Silverstone's South Circuit, which Jordan Grand Prix shared that Tuesday with the Brabham team. "He only did about 20 laps, but his fastest lap was as good as we'd ever done at that circuit," recounts Gary Anderson. "His commitment and car control were very impressive. He pushed pretty hard and found the absolute limit." 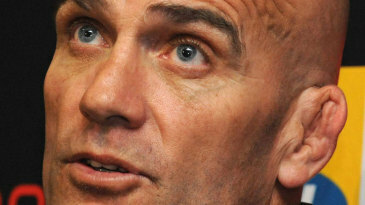 "His English was acceptable but it was not brilliant," says Foster. "He had to gain confidence in working with an English team. But it wasn't a problem, and over the weekend he got more confident in speaking the language. At no point was he overawed with the situation. It never fazed him. His fitness levels were right up to the mark. He said 'I don't know how fit you have to be to be a racing driver, but if I'm as fit as I can be then I know that if the pace of the car drops off it isn't me getting tired, it must be something to do with the car, or the engine, or the track, or the tyres'. He didn't want to leave anything to chance, he wanted to deal with known facts." Spa Francorchamps is no great distance from Michael's home town of Kerpen, and it was assumed that being a German racing driver with, despite his youth, a respectable portfolio of competition experience behind him, he would know the treacherous Ardennes tarmac as well as the back of his hand. In conversation with Eddie Jordan, Willi Weber alluded to this being true, but that wasn't the case. Schumacher had never driven the circuit. "From the word go he was very confident," says Gary Anderson. "I said to him 'Ah, you've done sportscars so you must know Spa quite well'. He admitted he'd never actually seen the track, which came as a shock". On the Thursday evening he fished around in the boot of his Mercedes to reveal a fold-up bicycle and went out for four pedal-powered laps while the team had their dinner. The next morning his mode of transport was the Jordan-Ford 191, chassis number five. Schumacher's first qualifying run that Friday was spoiled when the red flags came out following Eric van de Poele's high-speed spin. "After van de Poele's accident, I came straight back into the pits and had only one lap left in which to qualify," said Schumacher with some relish. To the disbelief of the entire paddock, he set a 1:53.290, the eighth-fastest time of the day. He went one place better on the Saturday, claiming a 1:51.212, and would have posted a quicker time had Jean Alesi not blocked him at the Bus Stop on his final lap. "Yeah, sure, I'm really happy," said Michael when he heard his final position. "I have to say that with this car you can do this qualifying time. The car feels good, which makes it a lot of fun to drive. For the time I'm really happy." "What he couldn't do on the Friday he knew he could do on the Saturday," says Anderson. "He knew he had a couple of days to build himself up and it wasn't worth trying to get everything perfect on day one and making a stupid mistake. He was disciplined." Foster recalls that Schumacher soon found where the limit was and stuck to it: "We'd had a lot of promising youngsters have a go in the car that year and quite often they'd get ahead of themselves and go off. It was sometimes a bit of a problem, financially. We were quite under-resourced and one knock could ruin a whole weekend for us. Michael, in the sessions, was never out of the top eight. I pulled him in at one point to ask him 'Are you sure you're not going over the limit?' His tone was just so calm: 'It's OK, don't worry, I'm on the limit but I'm not over it'. He was totally relaxed and took everything in his stride. "Michael suffered a water leak on the Cosworth in one of the sessions, and back then that would have been an engine-out job which would have put us out for the rest of the afternoon. Andrea felt there was something wrong with his car too and, because he was the senior driver, took the spare car. To get more laps I asked Gary if it would be OK for Michael to take Andrea's car. We bundled Michael in, and had no chance to even adjust the pedals or anything. Well, immediately, Michael was beating Andrea again… it was surreal." Foster remembers their post-qualifying debrief as a clear indication of Michael's commitment in the cockpit: "Andrea went into great detail about how, when he entered Blanchimont, the rear of the car would get very nervous, and there was a bump there where they'd resurfaced it. It would make the car unstable, which is why he wasn't able to take it flat. Andrea gave this long and detailed explanation, and at the end I asked Michael 'Is it the same for you?' Michael said: 'Well, it was for the first three laps but after that I just took it flat. If you keep your foot planted it stabilizes the car and away you go'. In Sector 3 he was always in the top three. "Before he came into F1 he wasn't talked about as the next messiah," adds Foster. "People would say he wasn't as quick as Hakkinen or Frentzen. He wasn't the star man". 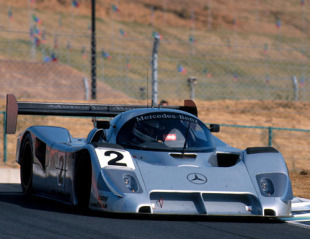 Karl Wendlinger, who had been such a close match for Schumacher's pace in Group C, was sitting at home listening to the radio when he heard of Michael's qualifying times: "I had the weekend off and heard the Saturday result on the news. My first thought was: 'If he can walk in at such a high level, maybe I should start thinking about it too'." Later that afternoon, though, for about half an hour it was questionable as to whether either Jordan driver would be taking to the track again that weekend. Belgian driver Philippe Adams claimed the team owed him money and, concerned that Eddie Jordan would leave Belgium without settling the debt, won a court order. Late on Saturday, police impounded Jordan's garage and a bailiff demanded payment. "We weren't allowed to touch anything. The bailiff wanted about £140,000 I think," says Ian Phillips. "We hadn't got it, and Eddie did a deal with Bernie who made sure the bailiff was OK. Eddie paid it back a few months later. It was sorted out very quickly and swept under the carpet. I don't honestly think Michael was aware of it." By the Sunday morning warm-up, having traded information, the Jordan team-mates were much closer. Michael finished the session fourth, one place ahead of de Cesaris and behind Patrese, Mansell and Senna. Schumacher lined up seventh on the grid for the race, Patrese having suffered a penalty because his reverse gear refused to engage. "The way his mind worked was that if the car was up to scratch there was no reason why he couldn't win the race," says Foster. "That might sound arrogant, but it wasn't arrogant in any way shape or form. Self-confident, yes, but totally justified by the way he handled himself in and out of the car." Gantry lights extinguished, the whole field swept through La Source with no contact, but as they charged up the hill Schumacher was seen slowing. His race was over almost before it had begun. Having never taken a start before with a heavy fuel load, he'd melted the clutch. The result was terminal. 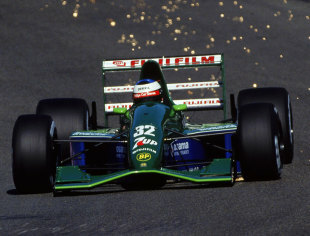 Jordan's huge potential that day was best exhibited by de Cesaris who ran as high as third and had a possible victory within his grasp, but three laps before the flag his engine failed. "Andrea did a great job that day, and I think some of it was down to Michael raising his game," says Foster. "I'm quite certain that if the clutch hadn't failed, Michael would have claimed a podium finish. Which step he would have stood on I wouldn't like to say." 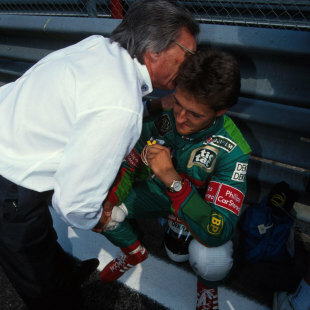 "I had no chance to watch the race in jail, I was busy surviving," says Bertrand Gachot, who described Michael as "a real gentleman" when they met later that year. "Some days later I received a letter from Andrea de Cesaris, a good friend. He wrote: 'That new boy - don't worry! I'm gonna get him at the next race!'" Schumacher and his entourage had left the circuit by the time the team's senior management came down from the pit wall. The next time Eddie Jordan and Ian Phillips saw Schumacher it was the Thursday night before Monza, at Lake Como's six-star Villa d'Este. "In Spa we stayed at a holiday camp. Five pounds a night. I shared a bathroom with him," says Phillips. In the space of a fortnight, Michael Schumacher had rocketed from being an unknown to the hottest property in Formula One - and he had the lodgings to prove it. Phillips and Jordan had been summoned to the Villa d'Este by Bernie Ecclestone. Since leaving Belgium 11 days earlier, their world had been turned upside down. Michael's talent had caught the eye of Benetton, a team which promised the opportunity to take Michael to the top. Ecclestone understood that a German championship hopeful would be box office gold and did all that he could to facilitate the deal. The two Jordan men stared through the plate glass windows as Schumacher, Ecclestone, Neerpasch, Weber, Flavio Briatore, Tom Walkinshaw and an army of lawyers finished their dessert course. 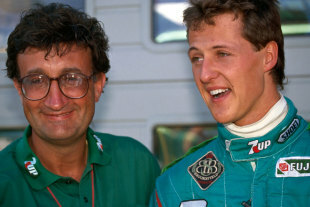 "The fact is that Schumacher, for whatever reason, had no contract with Jordan," revealed Walkinshaw, who was the Benetton team manager at the time. "How anyone can allow a talent like that to be walking around the paddock I don't know. That's their business." I'm sorry but I am unable to take up your offer of a drive. He would concede some years later: "When I first came into F1, I didn't understand what it was all about. I could drive fast, of course, but I had little idea about the complexity of the whole business; which little wheel you had to set in motion in order to get everything going. In effect, I just used to drive."